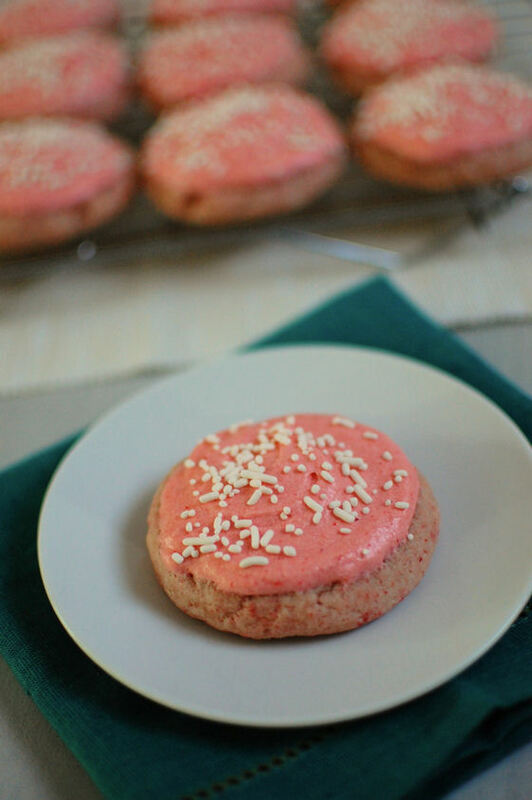 These pink Frosted Strawberry Sugar Cookies are soft and pillowey with a distinct strawberry flavor. I spent the first week in October at my alma mater, Purdue, to do some recruiting for work. Next up, Hubby and I headed to California for a beautiful wedding in Napa. While we were in Napa, my sister had her baby. But I couldn’t get over to see them as soon as I wanted because we had good friends from NYC in town. That weekend consisted of some pumpkin beer tasting, fires in the firepit, and just general good times catching up with great friends. 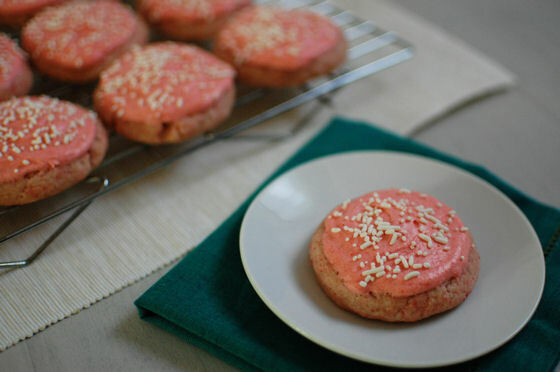 Through all of this traveling and time away from work, I thought I would have time to bring you guys more pink recipes in October. But I was distracted by the nostalgia of being back on campus, the allure of wine country, hanging out with a snuggly baby, and walking 40 miles… But I’m back now. 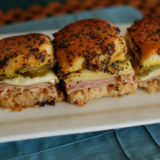 And I have a couple more recipes to share this month. So get ready! 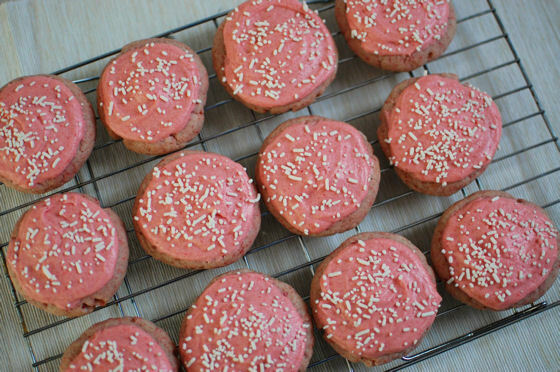 Not only are these cookies PINK without any food coloring, they’re seriously addictive. I made them when we had friends over for dinner. And let’s just say that the boys almost ruined their appetites by chowing down on 3-4 of these before dinner. They just couldn’t control themselves. 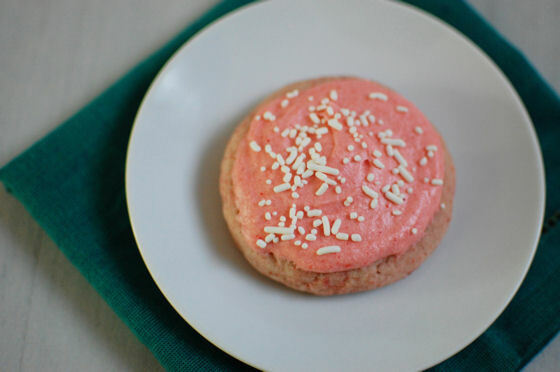 These cookies are similar in texture to these soft frosted sugar cookies, but with a distinct strawberry flavor. One of our friends said they almost felt like they had seeds in them, the strawberry flavor was so real. 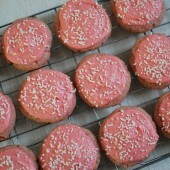 One thing to note – the cookies and frosting use freeze dried strawberries. Not dried strawberries. I had a major brain fart the first time I went to the store and grabbed dried strawberries. Which are great, just not what you need for the recipe. I was able to find freeze dried strawberries in my big-box grocery store near the dried fruit. Don’t forget about my Power of Pink Challenge! Make something PINK during the month of October to raise Breast Cancer Awareness and a chance to win a $100 donation to the charity of your choice. In a mixing bowl, whisk together cake flour, cornstarch, baking powder and salt for 30 seconds. Add 1 cup freeze dried strawberries to a food processor and pulse until ground into a fine powder. Sift ground strawberries through a fine mesh strainer (to remove seeds and the few small pieces remaining) into the flour mixture and whisk to combine. *Optional - while the food processor is out and dirty, go ahead and process the 1/3 cup of freeze-dried strawberries for the frosting. 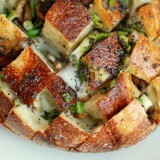 Sift into a small bowl and reserve for later. In the bowl of an electric stand mixer fitted with the paddle attachment, whip butter, shortening and sugar on medium speed until very pale and fluffy, about 4 minutes. Mix in egg, then mix in egg white and vanilla. Blend in food coloring if desired (I did not use food coloring). With mixer set on low speed, slowly add in dry ingredients and mix just until combined. 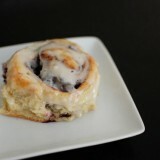 Transfer dough to an airtight container and refrigerate 2 hours. Preheat oven to 375 during the last 10 minutes of refrigeration. Line two cookie sheets with parchment or a Silpat. Lightly flow the parchment or Silpat. Scoop dough out about 3 Tbsp (50 g each) at a time and roll into a ball. 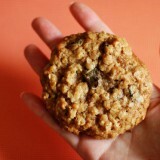 Sprinkle top of cookie dough lightly with flour, then using something flat and smooth (such as a glass), press and evenly flatten dough to about 1/3-inch thick. Bake in preheated oven 8-9 minutes. Allow to cool 2 minutes on baking sheet before transferring to a wire rack to cool. 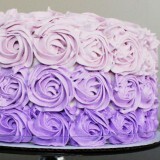 Cool completely then frost with Strawberry Frosting. In the bowl of an electric stand mixer, fitted with the paddle attachment, whip butter until pale and fluffy. Meanwhile, pulse 1/3 cup freeze dried strawberries in the food processor until finely ground. Using a fine mesh strainer to remove seeds, sift freeze dried strawberries over butter and mix to combined. 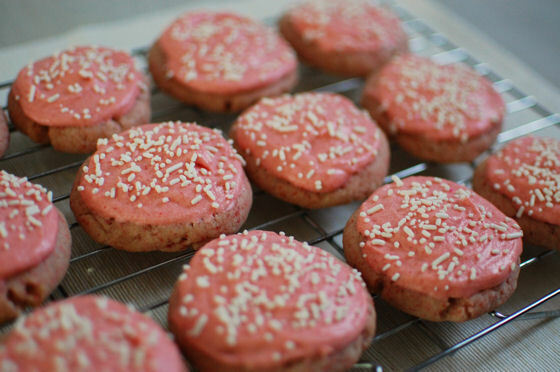 Stir in 3 Tbsp fresh strawberry puree, lime or lemon juice and vanilla extract (mixture will look separated and that's okay). Slowly mix in powdered sugar and whip until well combined. These are so adorable! 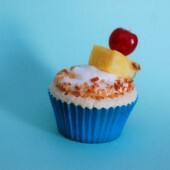 A friend once made me margarita cupcakes for a birthday, but I love the sound of all the coconut. these look incredible! I am LOVING cupcake week! These make me crave a warm summer day. This sounds like a fun, summery cupcake recipe! Love it! 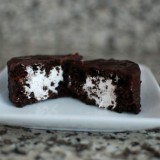 Mmm these look awesome! But where’s the rum? Tell me about it! I’m not excited about the rain/snow we’re supposed to get tonight and tomorrow. Good point! They have the flavors of a pina colada without the alcohol. If you wanted to add some rum, I’d throw it into the filling. 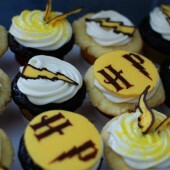 I’d like one of these cupcakes along with a pina colada on the beach! 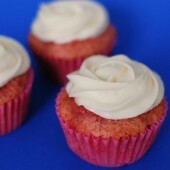 I’ve really been into “booze” cupcake lately and yours looks fantastic! Perfect for a luau or a summer pool party! Ooohhh Hawaii sounds awesome right about now. I’ve never been. oh my gosh, those look adorable, and i love the flavor combo, too!! Very nice! May I ask how you set the background for your cupcake pics? The solid colors really bring attention to the cupcakes themselves. For the majority of my cupcakes, I use a piece 12×12 scrap-booking paper for my backgrounds. I have a big stack of a variety of colors and patterns. I love the garnishes on the top, they looke exactly like little poolside drinks. I have been wanting to try a cocktail-like cake since I went to “cupcake happy hour” at Kickass Cupcakes in Davis Square. Have you ever been there? Because if you haven’t you must go and try their mojito! I have been to Kickass before during the Cupcake Crawl I hosted a couple years ago. In fact, we even tasted the mojito cupcake while we were there. Such creative finishing touches to a perfectly delightful cupcake.